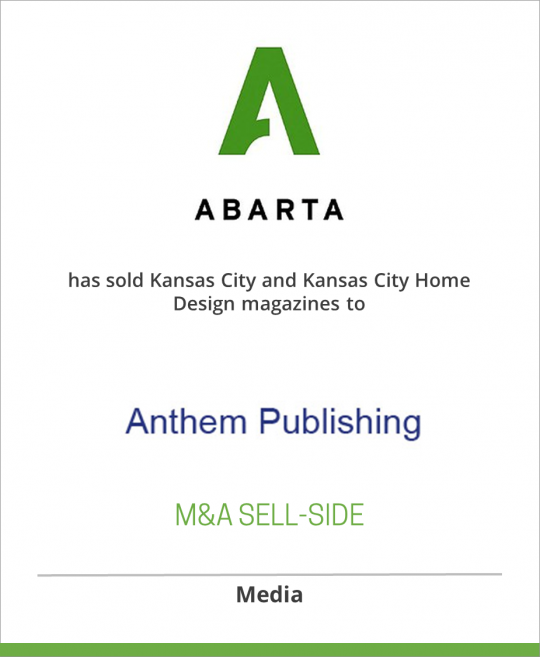 ABARTA Media Group has sold Kansas City and Kansas City Home Design magazines to Anthem Publishing, Inc.
ABARTA Media Group, based in Miami, Florida, is one of the country’s leading publishers of city and regional magazines – with publications in Orlando, Kansas City, Charlotte, Dallas, Utah and Colorado – as well as destination maps, dining guides and other custom publications. ABARTA Media Group’s parent company, ABARTA, Inc., is a $200 million revenue diversified company whose primary business includes Coca-Cola bottling franchises, oil & gas operations and financial services. It also publishes a daily newspaper, The Press of Atlantic City. Kansas City magazine is the only city magazine published for one of the Midwest’s largest media markets, Kansas City, Missouri. Kansas City is published monthly and has a circulation of 25,000. Founded in 1995, Kansas City Home Design is the dominant shelter book in the region with a circulation of 14,000. Anthem Publishing, Inc., is a subsidiary of Anthem Media Group, located in Overland Park, Kansas, a full-service custom publisher specializing in high quality books, magazines, and guides. Anthem Media Group and its subsidiaries, Anthem Media, LLC, Anthem Publishing, Inc. and Anthem Motorsports, Inc., now publish more than 164,000,000 pages across approximately 76 titles. Anthem Media’s award-winning Luxury Publishing Division provides website and catalog production services for finer retailers and designers from Los Angeles to New York. Anthem Motorsports produces specialized motorsports publications reaching an estimated 8 million fans across the U.S.
Sold to Anthem Publishing Inc.